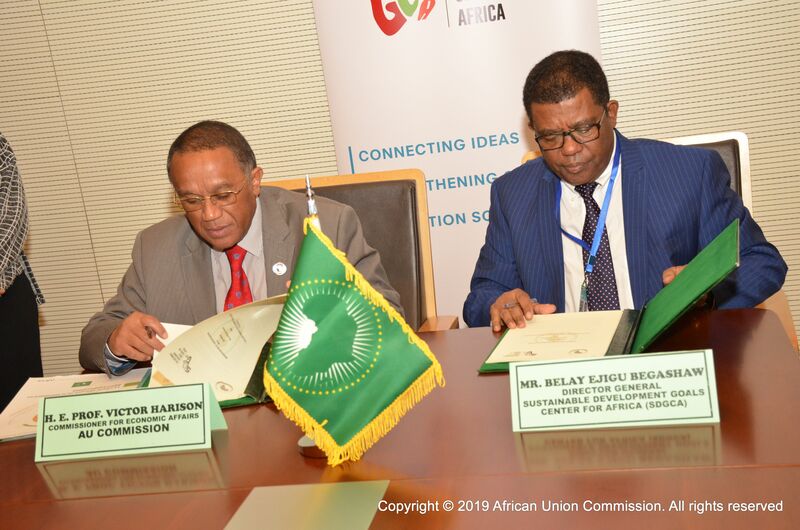 Addis Ababa, 9th February 2019:- At the sidelines of the AU 32nd Ordinary Session of the Assembly of the African Union, in Addis Ababa, Ethiopia, the African Union Commission (AUC) and the Sustainable Development Goals Center for Africa (SDGC/A) signed a Memorandum of Understanding (MoU). The MOU was signed today by H.E. Prof. Victor Harison, Commissioner for Economic Affairs, on behalf of H.E. Moussa Faki Mahamat, Chairperson of the African Union Commission and Dr. Belay Begashaw, Director General of the SDGC/A. The comprehensive MoU is a framework of cooperation and understanding to facilitate collaboration between the African Union Commission and SDGC/A on key matters related to Africa’s development agenda in order to improve the livelihoods of the people of the African continent. It aims at establishing a strategic partnership in order to capitalize on each of their comparative advantages and provide desired transformative support to AU Member States in support of achievement of African Union’s Agenda 2063 and the Sustainable Development Goals (SDGs). H.E. Prof Victor Harison noted that the signature of this MoU “will open the deepening of the state of achievement of the objectives of both development Agendas. On his part, Dr. Belay emphasized that both Agenda 2063 and SDGs are twin Agendas, one at the Continental level and the other at a Global level; and that the SDGC/A is keen on supporting and furthering collaboration with the AUC. With a common interest to bring about further support to AU Member States and Regional Institutions in their efforts to achieve Agenda 2063 and the SDGs, the AUC and SDGC/A are committed to work together to promote and facilitate Inter-country learning on Agenda 2063 and the SDGs, through the annual SDG Index & Dashboard for Africa, the SDG Citizens Report and other technologies and innovative practices qualified for Sustainable Development pathways to enhance SDGs implementation by member countries. These may include among others, best practices on education, health, water, agriculture and climate change. Innovative actions ensuring SDG financing and investment are of high interest given their critical role in achieving the African Development Agendas. The SDG Center for Africa is an autonomous not-for profit international organization that supports governments, civil society, businesses and academic institutions in achieving the SDGs in Africa. The Center was established by African leaders to ensure that they act together in pursuit of a shared African development vision and that Africa is well-positioned in the global forum with all other actors responsible for the global conversation and actions related to the SDGs.